BANKS and CREDIT UNIONS are businesses where people save money and receive loans. Banks and credit unions also provide financial services such as investments and insurance. Banks and credit unions are financial institutions where people save money and receive loans. 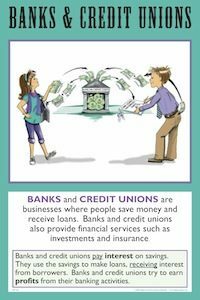 A credit union is a not-for-profit business that is owned and collectively controlled by its members, whereas banks are for-profit businesses owned by investors. Banks and credit unions pay interest on savings, but receive interest when they make loans. Banks and credit unions try to earn profits by receiving more interest on loans than they pay on savings. Banks and credits unions are part of the financial capital market. This important market, which includes stock and bond markets, helps direct funds from savers to investors. Investors use these savings to expand or start new businesses, thus providing jobs and economic growth. Consumers also borrow money from savers when they take out bank loans to purchase consumer goods, such as a car, or to purchase a home. Banks and credit unions also provide people with important services that help them exchange goods and services, such as checking accounts and credit cards. Banks and credit unions often provide other services, such as financial investments and insurance. Banks and credit unions are critical to the functioning of a healthy economy. Have students explore the very informative Bankrate.com. Compare and contrast interest rates of different banks/credit unions for Checking & Saving and for CDs (certificate of deposit) & Investments. These interest rates reflect how much banks pay to borrow money. Each week have students track interest rate changes at various banks and credit unions. List these changes in an economic “journal” or post on a bulletin board. Discuss how economic current events influence these changes. When comparing interest rates of various banks, have students investigate the different safety ratings of the banks, using the Safe and Sound® star rating system used by Bankrate.com. Have students research the different services offered by banks and credit unions.